The demise of the Beolit range in the late 70s marked the end of the B&O portable audio range – for a while. By this time, low cost equipment from Japan which was nevertheless capable of reasonable results meant that there was a limited market for the high quality Beolits, all of which were made in Denmark with expensive components. Text copyright © Beocentral. Unauthorised reproduction prohibited. In the mid 1980s however, B&O re-entered the portables market with what was effectively a new Beolit in all but name, the Beosystem 10. Unlike any of the Beolit models, it was stereo and included a cassette recorder, though there certainly was a design continuity in the layout of the control panel. The machine was very well received, and though expensive (but not excessively so), proved popular. The perfect product? No. Text copyright © Beocentral. Unauthorised reproduction prohibited. To start with, former Beolit owners would have been immediately disappointed with the control panel. 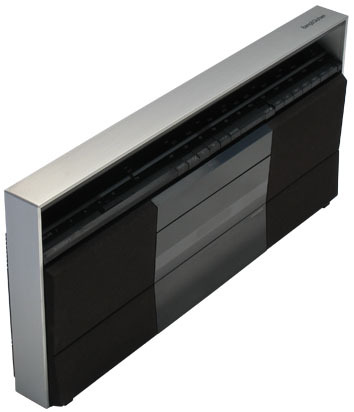 Gone were the elegant aluminium extrusion and the elegant controls, everything was made from dull black plastic. The Beolit’s nice slim handle had vanished too, to be replaced with a larger version that was fixed in position and so could not be folded out of the way. What was effectively the first B&O battery portable cassette player disappointed too. For a start, there was no Dolby noise reduction, making the set incompatible with any B&O cassette deck of the previous 10 years. Not since the Beocenter 1600 of 1976 had a model been offered without Dolby. Chrome tapes could be accommodated though, but how many people made non-Dolby recordings on these? This was an unforgivable omission, for even personal cassette players (for example the Sony “Walkman”) were available with Dolby noise reduction while the Beosystem 10 was on sale. The cassette mechanism was not auto-reverse either, unlike every other new cassette machine in the B&O range of the time. Text copyright © Beocentral. Unauthorised reproduction prohibited. The amplifier section, while being reasonably powerful, was not without fault either. Instead of proper separate treble and bass controls, a single control was fitted, where the centre position gave a neutral response, and going up or down from this attenuated either treble or bass. Hardly satisfactory for equipment in this class! A second control enabled a certain amount of phase distortion to be introduced, making the loudspeaker spacing appear “wider”. It was best left in the “normal” position. The loudspeakers looked almost like Beovox CX 50s, though they were not. Most importantly, there were no tweeters, limiting the top end response. 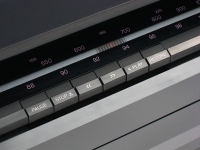 Perhaps the best part was the radio, offering both AM bands, FM stereo and three preset FM stations. The controls for these were located behind a hinged cover below the cassette door. Text copyright © Beocentral. Unauthorised reproduction prohibited. 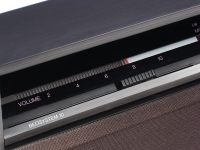 So overall, the Beosystem 10 offered similar performance to a typical Japanese radio cassette, because that is what it was! The whole thing was made by the same company that made the Beocenter 2200, and while some B&O input was obvious (in particular the design of the battery contacts was just like the later Beolit models), it was clear that the Danish content was minimal. The circuit was elaborate though, with a powerful amplifier and a built in regulator to allow power to be taken from a car or boat battery. Connections were also present for a pair of external loudspeakers (with the same type of sockets as the larger Beomaster and Beocenter models) and for an auxiliary input source. This was in the form of two RCA type sockets, and a switch was fitted so that either a record player (Beogram RX) or a CD player (Beogram CD X) could be used. A slot into which an earthing lead could be inserted was positioned next to these sockets for use with turntables that required it. Text copyright © Beocentral. Unauthorised reproduction prohibited. In fairness, building the Beosystem 10 in Denmark to the same standards as the more expensive models in the range would have made it far too expensive. A little extra thought at the design stage would have made it a much better and more useful machine though. 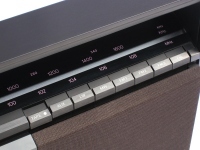 It was quietly withdrawn in the early 90s and not directly replaced, though eventually the Beosound Century appeared, which apart from not being battery operated, filled a similar place in the range. The Beosound Century is designed and made in Denmark, and was much the better for that. Text copyright © Beocentral. Unauthorised reproduction prohibited.